Trabzonspor striker Caleb Ekuban scored his second international goal in four days as Ghana recorded a 3-1 win over Mauritania in a pre-AFCON friendly match played at the Accra Sports Stadium. Ekuban, who netted on his debut for Black Stars in the slender 1-0 win over Kenya last Saturday, scored the second goal in the win on Tuesday. The Black Stars couldn’t have asked for a better start to the game as they opened the scoring in the third minute. Kwasi Appiah, who was making his first Black Stars appearance in four years, was brought down in the penalty box and he stepped up to convert the spot kick. Ghana failed to capitalise on the early lead as the Al-Murabitun gradually grew into the game. The Mauritanians took charge of the game and controlled proceedings as they pinned the Black Stars back into their own half. They, however, failed to create any real openings in the first half despite recovering pretty well after conceding early. Mauritania came out in the second half as the better side and appeared more motivated. It was evident coach Corentin Martins asked for more directness from his side and they were rewarded in the 48th minute as Adama Ba buried a free kick from about 20 yards. At 1-1, coach Kwesi Appiah tweaked his tactics and brought on key players such as Mubarak Wakaso, Jordan Ayew and Christian Atsu. 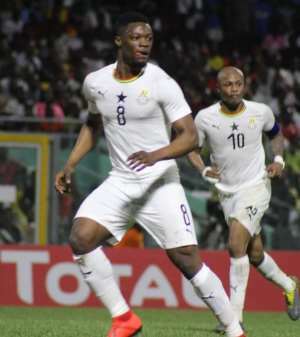 The changes proved crucial as the Black Stars took charge of the game. Atletico Madrid midfielder Thomas Partey wasted two great opportunities to give Ghana the second goal. In the 70th minute, Jordan Ayew combined with Lumor Agbenyenu on the left and the on-loan Gotzepe man whipped in a cross which was headed home by Caleb Ekuban to make it 2-1. Four minutes later, Partey finally found the back of the net by smashing into the roof from close range. Black Stars held on to see out the remainder of the game as Kwesi Appiah registered his seventh win since his reappointment in 2017.